The Eton Wick Village Hall committee published a newsletter for a short time in the 1950's. 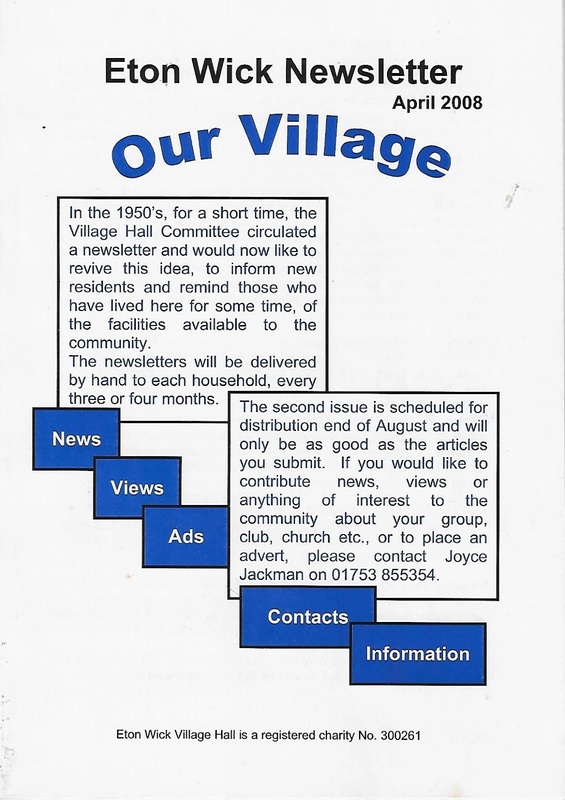 In 2008 the Committee revived the idea and have been publishing a magazine three times a year since April that year delivering it free of charge to every house in the village. The Eton Wick History Group are delighted to have their kind permission to share these insights into village life on this website. 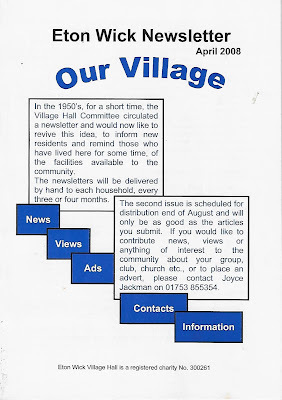 We will be showing the front cover and the regular Village history feature articles many of which were written by Frank Bond on the front page. There will be a link to images of each complete Our Village that we republish at the end of each post. We are very fortunate in Eton Wick to have open country all around and the river so close by. This should not be taken for granted. A village, albeit very much smaller, has stood here for hundreds of years and very probably people were living here, close to the river, before the village had its Anglo Saxon name. Although the village boundary reached east to beyond the rail viaduct until the 1920's and the west boundary to Bell Lane until 1934, most of the homes before the 19th Century were concentrated along Common Road between the Wheatbutts and Sheepcote. At the beginning of that century there were approximately 100 villagers and by 1860 about 300 (probably one tenth of today's population). Of course this included the six or seven farms which were a little north of the residential Common Road and marginally on higher, less likely to flood, ground. 200 years ago Sheepcote was not an inhabited road, but a muddy farm track alongside the Sheepcote fields which belonged to the crown. The Walk was non existent. The early dwellings mostly had very long gardens which stretched from Common Road to the main road; and the few 18th and 19th century homes along the main road had extended gardens to Common Road. The Three Horse Shoes' pub's garden was likewise, as was the tiny ten terraced cottages east of that pub. Unable to build on the lammas, common or crown lands, and west of Bell Lane being in the different parish of Burnham, the long gardens were sold off as building plots. The green spaces of today were yesteryears jealously guarded grazing rights. These rights never did extend beyond Bell Land and of course still do not. With old Eton Wick filling up it looked like a stalemate until in 1870 the Eton Council purchased Bell Farm, to be used as the town's sewage farm. The farm was bigger than needed and in 1875 they sold 75 acres of mainly pasture that was west of Bell Lane. Although Bell Farm was just inside the Eton Wick boundary, much of its actual farm land was the other side of Bell Lane and consequently came under Burnham. In fact the farm had already built farm cottages for its employees along Bell Lane and on adjacent land. Soon after the initial sale of the 75 acres it passed into the hands of local man, Mr Ayres. Roads were laid out in Alma, Inkerman and Northfield and he sold plots of the land parcel by parcel. At last room to expand, but being in the parish of Burnham — not Eton Wick. Being close to old Boveney it was called Boveney Newtown. It had its own council, a chapel and two shops. This was during the last two decades of the 19th century. Although not part of the scheme it triggered off building along the main road and establishing Victoria Road, a cul-de-sac with its long terraced row. Village organisations predating the 1934 unifications under Eton Urban are generally known as Eton Wick and Boveney i.e. Women's Institute, Scout Movement, War Memorial etc. Development west of Moores Lane all came after World War 2 — another story. The crown lands are now Eton College owned and will surely be protected in their own interests. I like to believe their interests are mostly the same as ours, preservation of Lammas and common lands as far as it is reasonably possible. Without small holdings, livestock on the farms, the need to glean and graze, a general apathy believes all will take care of itself and we will keep the centuries-long pastures. Perhaps it is later than we think. Click here to read Our Village April 2008 - the first edition of the Eton Wick Newsletter that this year celebrates its 10th anniversary.